Amid snow NHM Employees staged a massive protest and blocked Road at Lal chowk srinagar while Demanding regularization of their services. Employees working under NHM today held a massive protest demonstration in Srinagar. 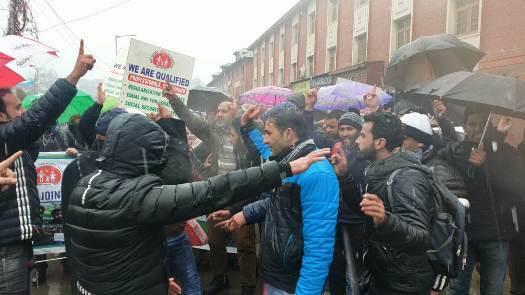 Scores of employees, holding banners and placards assembled in Srinagar and raised slogans and demonstrated against the government apathy towards their just demands.